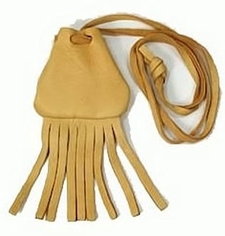 This medicine bag is made from butter soft buckskin in your choice of leather colors. It measures approximately 2" x2" and has fringes along the bottom. The drawstring averages 30" and is long enough to wear it as a necklace. This product was added to our catalog on 10/02/2018.